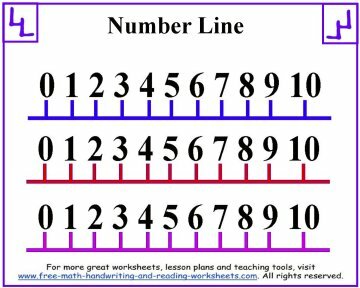 Use the printable number line worksheets below as a helpful study guide for your child's math homework. My son first started using number lines in the 1st Grade with his counting worksheets, but Kindergarteners can benefit from their use as well. We've even been using them with our Pre-schooler to help her learn how to count up to ten and beyond. When learning their numbers, a number line can help the child to visualize how numbers are set up and arranged. It also makes simple addition and subtraction problems easier to work out. 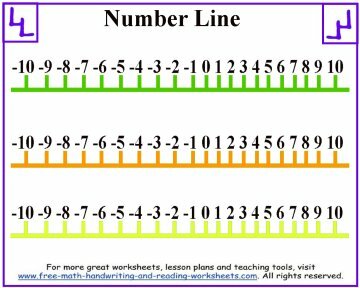 There are three different types of number lines below that you can print out. Click on the images below to open up a printable file in another tab. The first number line is great for Pre-K and Kindergarten kids that are just beginning to learn their numbers. It is a simple number line from one to ten. As I mentioned above, it has worked great with our littlest who is in pre-k classes and learning how to count. 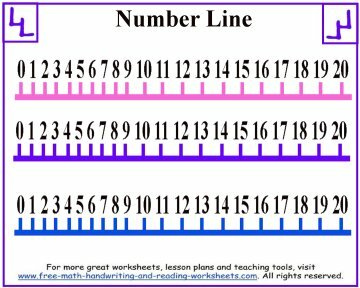 There are 3 number lines on the sheet, so if you're using this in a classroom setting, you can cut out each line for up to three students. The next number line goes up to twenty and is a great resource for children learning their addition facts. Again, these are good for younger kids too as counting from 10 to 20 seems to be harder for them. Our kids have always struggled with the numbers from 11 to 20. Once they get to 20 they're pretty good, but there's something about all those elevens, twelves, and thirteens that trips them up. Print these out and use them alongside the lessons found at the bottom of this page to teach your child about counting and number order to 20. The last worksheet begins with negative numbers (10) and works up to positive numbers (10). It's a great way to introduce the concept of negative value to your child.